As we predicted, Russia’s “new” government has begun its first serious reform — raising the pension age. Russia currently has one of the earliest pension ages in the world — 60 for men and 55 for women. The government approved today a plan to gradually raise the pension age for men to 65 and for women to 63 by 2036. Even if this change will be the only one that Dmitry Medvedev’s government pushes through, it should be recognized — this is a really massive and unpopular reform which Vladimir Putin’s regime wished but was afraid to undertake for the past 18 years. The low pension age combined with the fact that practically 100% of pensions are funded from the state budget is one of the three most problematic institutions that were inherired by the Russian market economy from the USSR and had still not been dismantled. The other two problem areas are free (in name) health care and education. It was clear at least 20 years ago that the pension age must be raised. The present ages were approved by the USSR in 1932, when life expectancy was 35 for men and 40 for women. Now Russia’s average life expectancy at birth is almost 73, for 50 year olds today it is 68.6, and for 30 year olds today it is 69.4. There was already a suggestion to raise the pension age by 5 years in 2002 in Vladimir Putin’s 2000 economic programme. However, the possibility of mass protests by Russians against this reform was so high that the reform was delayed by 18 years, although each new government did try to raise the issue. It was now necessary for the government to actually carry out the unpopular reform for two reasons. First, Russia’s pension system just cannot survive any longer withoutre form. In the golden days of the USSR, there were 3.7 workers for every pensioner; now there are 2, and by 2044, this figure will fall to 1.5. Labor productivity in Russia is the lowest in Europe, and is growing much slower than the number of pensioners. Pensions in Russia are already very low (the average monthly pension was RUB 13,700 or $220 in 2017), but even these payments destroy the state’s finances. In 2018, the state will have to transfer RUB 3.4 trillion (almost $55 billion) to cover the deficit in Russia’s state-run Pension Fund. This amount is increasing each year. Second, there will not be a more ideal political moment to begin an unpopular reform. Vladimir Putin just won the presidential election with 77% of the vote. The next major election, for the Duma, will only be in 2021. In 2024, Putin must either name a successor, or extend his own rule, bypassing the Constitution — in other words, it will not be a smooth election cycle like the one we have just witnessed. Follow us at Medium to get inside Russian politics and business. Join the discussion and share opinion at our club on Facebook. Nevertheless, 92% of Russians are still against increasing the pension age. Therefore, the government is trying to carry out the reform as quietly as possible. The state television channels try (Russian) to speak as little as possible about the increase to the pension age. Vladimir Putin smartly points out (Russian) that “concrete steps” are put forward by the ministers. Finally, it wasn’t a coincidence that the government announced its reform plans on the day of the 2018 FIFA World Cup’s opening in Moscow, when Russia played its first game, and the majority of the country’s residents had no time for news about pensions. It is not surprising that the government doesn’t want to advertise the reforms. Vladimir Putin can say that the government’s main task is to increase pensioners’ incomes, but at the same time, the primary goal of pension reform is to save the Pension Fund and take the pressure off the state budget. This means that Russians will not feel a direct reward for retiring 5-8 years later than before: over the past three years, monthly pensions rose on average by RUB 400-500 ($7-9) annually, and now they will increase by RUB 1000 ($16) each year. In addition, the life expectancy of a Russian man of pension age will become the lowest among all the countries which run a pension system — less than 10 years. Women have a much longer life expectancy post-retirement (it’s now 26 years), but after the reform this figure will fall by one third. The increase in the pension age is only one part of the solution to the problem. The current pension system is in its design still Soviet — pensions are funded almost entirely from the state budget. Since the early 2000s, the Russian government has tried to develop a funded pension system which would incentivize workers to invest independently part of their mandatory contributions into private pension funds. But in 2014, all of these payments were frozen as the Pension Fund didn’t have enough money and these funds were used to pay out pensions. It is still not clear if Dmitry Medvedev’s government will change this situation. It is not a bad sign that Russian authorities are, in the 18th year of Vladimir Putin’s unwavering leadership, and even under the pressure of tough necessity, capable of undertaking an important, unpopular reform. But there is also a bad sign. On June 14, the government also voted to increase VAT from 18% to 20%, which tells us that the goal of new Russian reforms is to patch the budget and find money for social spending, rather than to provide economic incentives for private businesses. The U.S. Treasury Department introduced new sanctions against Russians and Russian companies who work with the FSB and undermine the security of the U.S. and its allies. This time the list includes three companies which specialize in cybersecurity – two of these companies have their headquarters in the U.S., there is also a research institute under the auspices of the FSB, and, perhaps most interestingly – a supplier company of deep-water equipment for government agencies. We have gathered the most important information about the new additions to the sanctions’ list. Cyber specialists from Silicon Valley. Three companies from this sector were added to the list: Digital Security (a Russian company) – for cooperation with the FSB which is under U.S. sanctions, and also the Israeli firm, EMBEDI, and the Dutch-Czech-Israeli firm, ERPScan, – for their connections to Digital Security. Among the latter’s clients are Russian fuel companies, in particular, the company analyzed the defensive systems of Sberbank and Bashneft. ERPScan’s headquarters is in Palo Alto, and the company monitors Germany’s SAP security systems. EMBEDI is headquartered in Berkeley and provides security solutions for “smart devices”. Neither ERPScan, nor EMBEDI were ever mentioned in relation to work for security services or cyberattacks. They both found themselves under sanctions because of their founder – Ilya Medvedovsky; he is also the owner of Digital Security. Soviet scientific research institutes. The “Quant” institute was founded in the 1970s on the basis of a design office which launched the first computers in the Soviet Union. In 2008, the FSB took over management of Quant, and seven years after that, in 2015, it bought the software “Remote Control System” from an Italian company, Hacking Team (Reports Without Borders ranked this company as an “enemy of the internet”). This software can track all activities on an infected device: from correspondence over messaging applications and email to which keys were tapped on computers and smartphones. According to reporting by Meduza, the Italians presented the software directly to FSB employees ahead of the sale. Divers with a hacksaw. The company “Divetekhnoservice” was Russia’s largest supplier of underwater equipment. 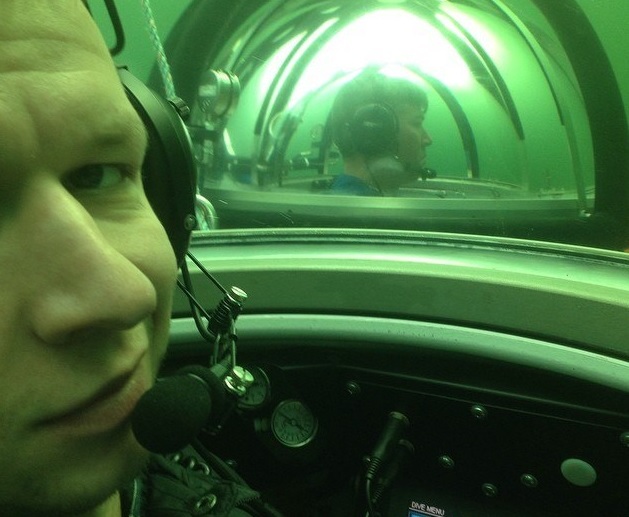 In 2012, the company supplied Canadian-made “DeepWorker” underwater vehicles (in the photo a manager of Divetekhnoservice, which has been named in the new sanctions, sits in one such vehicle). One of the purchasers of the delivery was the Yantar shipbuilding factory. A vessel produced by this factory was seen several times near telecommunications cables, in fact during times of crisis for the region. For example, in 2015, it was spotted along the coast of Cuba (just as Washington D.C. and Havana were improving their bilateral relations), and in 2016, near Syria. According to Popular Mechanics, DeepWorker vehicles were on board the Yantar vessel. But Divetekhnoservice didn’t stop its flurry of activity there. The lion’s share of the company’s contracts (approximately $48 million for 2014-2017) were from the Ministry of Defense: these included a contract to supply equipment for underwater cutting. The OFAC document also states that in 2011, Divetekhnoservice received an FSB contract worth $1.5 million. It might seem surprising that Divetekhnoservice found itself on the sanctions’ list, as Russian cyberattacks are mentioned far more often than underwater research. But at the same time, this is logical. The OFAC document separately points out that “Russia actively surveyed underwater communications cables which transmit the majority of the world’s telecommunications data”. There were earlier fears: the U.S. and the UK feared that Russia would cut the cables and the West would lose its communication channels. Then, the deputy head of Russia’s upper house of parliament called the fears “absurd” (Russian). Nevertheless, in 2017, NATO Rear Admiral Andrew Lennon noted unprecedented Russian activity in the zones near the cables, and the Russian Federation’s new military doctrine (which Putin signed in 2014) clearly states (Russian): one of the main tasks in order to prevent conflict is to reduce the risk of the use of communications technologies for military and political goals. Russia denies any efforts to cut off the global internet, but in any case it is preparing for such a scenario. Over the past few years, a variety of ideas have been discussed in support of a sovereign internet – for example, the Security Council suggested in 2017 the creation of a separate internet for BRIC countries independent from American infrastructure (Russian). More than half of Russians supported (Russian) this idea, and one quarter were in favor of a closed internet “just for Russia”. Several years prior, Roskomnadzor and the Ministry of Communications carried out a study (Russian) in the event if Russia were to be cut off from the global internet – which Putin, in his words, called (Russian) a “CIA project”. It was then clear that Russia’s infrastructure might not be able to cope with this problem. The answer is clear — the consequences of cutting transatlantic cables might be catastrophic, and we can see from the indirect features that Russia at a minimum is preparing for the possibility of being cut off from the global internet. However, it is difficult to imagine that Russian authorities would take such actions unless they were to face a direct military conflict with the West. So for now, it seems we are safe. On Thursday, the FIFA World Cup began in Russia. According to various estimates, the country spent between $11-20 billion in preparation to host the event. We tried to estimate who will make the most money during the tournament. FIFA will earn a guaranteed profit, Russia will end up in slightly positive territory, ticket scalpers have already earned collective net profits of $44 million, and ordinary Russian citizens are trying to make money by renting out their apartments to fans — but their expectations of super-profits have already turned out to be inflated. The International Federation of Association Football, or FIFA, stands to make the most money from the World Cup. FIFA will generate a net profit in 2018 of $1.1 billion, and this will help to cover losses of $997 billion which were generated over the last three years of the football cycle. FIFA will earn revenues from the World Cup of $6.1 billion, 27% higher than what it brought in during the 2014 World Cup in Brazil. Its primary sources of revenues are sales of television broadcasting rights ($3 billion) and sponsorship revenues ($1.45 billion). For Russia, estimates vary regarding how much was spent on the World Cup — according to the official budget, RUB 675 billion ($11 billion) were spent, but RBC calculated that Russia spent RUB 883 billion ($14.1 billion), and Bloomberg puts the figure at $20 billion. Moody’s estimates the positive effect of the World Cup on the Russian economy to be $12.2-$16.5 billion over five years. The Russian government provided a similar estimate ($13.8 billion). Although on a smaller scale, ticket scalpers will also do well (Russian) during the World Cup — despite all the measures against them, scalpers have already sold 140,000 tickets with an average price of 200% of the face value of the tickets, generating no less than $40 million in collective net profit. There are surprisingly no solid estimates for how much Russian businesses will earn from the World Cup — this is first and foremost restaurants and hotels. Russian media have written far more about how ordinary Russians are trying to make money by renting properties out to foreign fans. Renting out apartments is as an important source of income for residents of Russian cities as it is for residents of the world’s most popular tourist locations: apartments in buildings constructed during the Soviet Union are usually the only property which ordinary Russians inherited, free of charge, during the privatizations of the early 1990s. During the World Cup, 600,000 foreign fans are expected to travel to Russia — and these are only those who bought match tickets (in first place, despite tense geopolitical relations, are Americans — 88,000). There are not enough hotel rooms to go around, and prices for these rooms during the World Cup have been regulated by the government. As a result, prices in the “grey” market for private apartment rentals via Airbnb or other websites where prices are not regulated have in some cases risen as much as ten-fold. If you look at this statistics provided by Avito, Russia’s largest provider of classified ads, you can draw one conclusion — it is the residents of Russia’s cities on the periphery who will experience the biggest boost to their incomes vs. a normal season. In Volgograd, the average price for an apartment rental for one night during the World Cup increased five-fold in half a year, in Samara – 4.5x, in Kazan and Sochi – 3.5x. In major cities, the price difference isn’t so stark — in Moscow, prices have only doubled, and in St. Petersburg, Russia’s most popular tourist destination, prices haven’t changed at all. However, from the chart it is clear that in the spring, landlords (particularly, for some reason, those in Volgograd) hoped for more, and by June, weaker than expected demand forced them to keep their appetites in check. Poor relations with abstract Americans from propaganda television shows haven’t stopped ordinary Russians from warmly welcoming real fans from the U.S., nor from trying to make money off of them — which is чем не доказательство того that relations between countries can be improved when there is a desire to do so. All of Moscow has been discussing the film “The Sobchak Affair” this week. The screenplay was written by Ksenia Sobchak, who was recently a presidential candidate, about her late father. The film is supposed to be released in English this fall. It is worth watching because it provides a look at not one but two main characters. By the middle of the film, Vladimir Putin enters as the second main character. The six minutes which the president spent in front of the camera explain a lot about why he built the state which became modern Russia. Here’s the trailer; unfortunately there’s only a Russian one. Anatoly Sobchak is one of the key figures in the political biography and mythology surrounding Vladimir Putin. During Perestroika at the end of the 1980s, former Leningrad University law professor Sobchak became one of the most memorable pro-democracy politicians. After Boris Yeltsin came to power in 1991, Sobchak was elected mayor of St. Petersburg. He named his university friend, a former KGB officer, Vladimir Putin, as his deputy for external economic relations. Putin held this post for five years, and it is during this period that he is accused of having had ties to organized crime. After Sobchak’s unsuccessful re-election campaign for mayor in 1996 Putin, and until Sobchak’s death in 2000, Putin supported his former boss in his conflict with President Boris Yeltsin and his advisors. This film is about the past, but it provides a lot of food for thought about the present. The story of Sobchak’s rapid rise on the back of popular support and his subsequent tragic fall explain a lot about Putin’s current actions. The film, for example, explains how Sobchak was knocked down by Boris Yeltsin’s former head of security, Alexander Korzhakov. From this, it is clear why Putin today tries so hard to control the “siloviki” and why it is unacceptable for him that they support the opposition. The film also features businessman Yury Rydnik, who invested $12 million in Sobchak’s defeat. This explains Putin’s conviction that businessmen should stay far away from politics (if, of course, they don’t want to suffer the same fate as Mikhail Khodorkovsky). Just before the end of the film, Putin himself appears as Sobchak’s saviour – other than Putin, the disgraced mayor didn’t have any real friends with him in a critical situation. It is possible that for this reason Putin relies so heavily on a few people from his own past, who he refers to as his friends (they are all presently under U.S. sanctions). One of the most memorable scenes in the film is Putin’s recollection of how he personally organized and carried out a special operation to save Sobchak when attempts were made to put him in jail. By this time, Putin had already moved to Moscow, but when he learned that Sobchak was in danger, he rushed to help him. Putin also admits that he closed his eyes to the fact that Sobchak faced felony charges and was accused of corruption. In order to save his former boss, Putin even kept the plan a total secret in order to take Sobchak to France in an undercover operation. The details sound like a spy thriller. In response to the question, why did he do all of this, Putin simply replied that he knew that Sobchak was innocent, and therefore closed his eyes to the law. This is a clear contradiction to how Putin now responds to similar requests – each time Putin is asked to offer mercy to those involved in court cases – from the YUKOS affair to the arrest of director Kirill Serebrennikov, Putin answers that he cannot involve himself in the affairs of the courts and investigations. Instead of seeing a person, time and again Putin sees a function. Those who live in modern Russia are well aware of Putin’s trait. But for those who will watch the film in English and aren’t that familiar with Russia’s domestic affairs, it is important to point this out. Ksenia Sobchak, unfortunately, didn’t ask Putin about this contradiction. History is a poor predictor of the future, but it explains the present well. In order to answer the question which has been relevant for the West for some time — what is inside Putin’s head? — we suggest you don’t read Putin’s biography, but instead watch the film about Sobchak. If only in order to conduct a dialogue from the other side of the Iron Curtain, it is not a bad idea to understand the motivations and driving principles of your conversation partner.